Sydney offers a safe, secure work environment with comprehensive laws to ensure all employees –including international students –are treated fairly and have access to a range of basic entitlements. 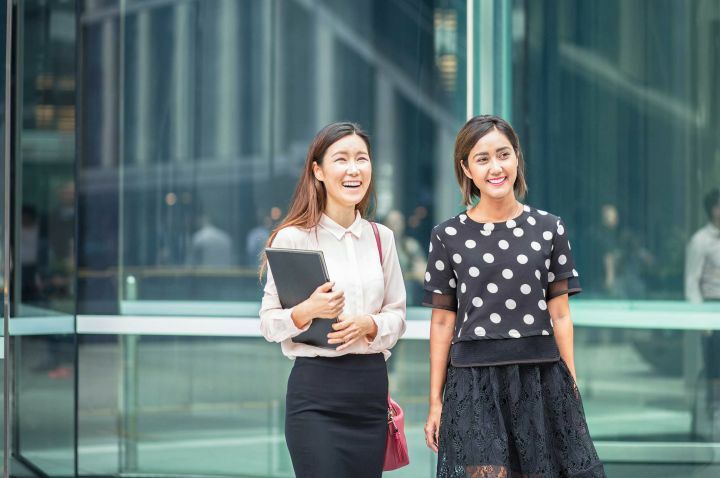 Not only is it a great place to kick start your career with many of the top 500 companies located in Sydney and the NSW region, it boasts low unemployment, high graduate salaries and companies that value an educated and multilingual workforce. If you plan on working while you study you will find that NSW has a very high minimum wage of $18.29 per hour, to offset the cost of living in Sydney. Many of our students work while they study with us and it’s not too hard to find a job that will work around your study commitments. There are many opportunities in retail, IT support and administrative support roles. If you’re unsure how to apply for a job or need some support with your cv we have career support services to help you. If you are working while you study you will require a Tax File Number (TFN) in order to claim the tax free threshold and decrease the amount of tax that you pay to the Australian Government, you can do this through the Australian Tax Office (ATO). It is compulsory in NSW for your employer to pay into your superannuation fund. Superannuation is a regular payment, paid by your employer toward a future pension for your retirement. While you are entitled to this, you will not be able to access the funds until you are retirement age or are leaving the country. Most employers will have a preferred fund or you may select your own. You cannot work until your course has started. Once your course has commenced you are permitted to work a maximum of 40 hours per fortnight when your course is in session, and unlimited hours when your course is not in session. Work that is a formal registered part of your course is not included in the limit of 40 hours per fortnight but some forms of internships and voluntary work may count so always check. To find out more about working while studying with us visit the Department of Home Affairs website. There are a number of ways to find work, speak to other students on campus and ask where they are working and if there are any opportunities. Once you are accepted as a student at La Trobe you will be able to login to the Career Hub which advertises jobs for students and graduate opportunities. One of the main websites to search for jobs in Australia is www.seek.com.au but you can also contact employment agencies who will meet with you and try to match you with any relevant opportunities they may have based on your skills and experience. As a thriving internationally-focused city, Sydney is known for strong graduate salaries. According to the Australian Graduate Survey, the average business graduate, in first full time employment under the age of 25 can expect to earn $50,000 AUD per year. However Hudson’s Salary Guide 2018 shows Sydney salaries for roles such as Business Analyst or Project Manager as ranging from $100,000 to $140,000 AUD dependent on industry and experience. High wages also apply when you are studying. The minimum wage in NSW is $18.29 an hour, however there are some industries that pay more and/or attract penalty rates for overtime, weekends and working public holidays. The Fair Work Commission has a penalty rates calculator to help you check what you are entitled to. Australia has strong employment laws to protect workers and this includes international students on a visa. Depending on your industry and the conditions of your employment entitlements include a minimum wage, superannuation, penalty rates and holiday and sick leave. It’s important that you understand your rights and entitlements when signing up to employment. If you have concerns or questions there is detailed information on The Fair Work Ombudsman website. If you find yourself needing advice the Redfern Legal Centre provides free legal advice to international students. A visa is available for graduates allowing you to work in Australia temporarily after you finish your studies. To find out more about The Temporary Graduate visa (subclass 485) visit the Department of Home Affairs website. While you are studying at La Trobe University Sydney Campus, you will have the chance to participate in our Professional Internship Program, which gives you professional work experience in your chosen field and prepares you for the Australian workforce. You will also have access to the Career Advantage Program that supports you in all aspects of finding employment from help with your cv, interview tips techniques and practise and support from academic advisers.